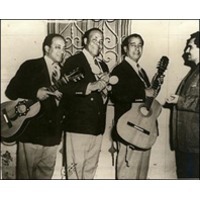 The Trio Matamoros were one of the most popular Cuban trova groups. Formed in 1925 by Miguel Matamoros (Santiago de Cuba, 8 May 1894 – 15 April 1971; guitar), Rafael Cueto (Santiago de Cuba, 14 March 1900 – 7 August 1991; guitar) and Siro Rodriguez (Santiago de Cuba, 9 December 1899 – Regla, 29 March 1981; maracas and claves). All three were singers and composers. The Trio Matamoros played boleros and son. They toured all Latin America and Europe and recorded in New York. In 1940 Guillermo Portabales performed with the trio. Matamoros expanded the trio into a conjunto for a trip to Mexico and hired the young Beny Moré as singer from 1945 to 1947. They recorded many 78rpm records and LPs; some of their output is available on CDs. The group were renowned for the harmony of their voices, and the quality of the lyrics.